I was so excited when I found a dupe for Pixi Glow. Bravura Revitalising Ginseng Toner with 5% Glycolic Acid was pretty much the same thing, only cheaper. Then, they ruined it: the price went up, the mls were fewer… In the end, Pixi Glow turned out how to be the cheaper option! Then, The Ordinary came along. Their Glycolic Acid 7% Toning Solution looks like the perfect candidate to knock Pixi Glow off its throne and gain the crown for best exfoliating toner out there. Glycolic acid is the most famous member of the Alpha Hydroxy Acid family, a group of exfoliants derived from fruits and sugar cane (GA is derived from sugar cane). Irritation: everything that removes dead skin cells can irritate skin. The lower the dose of GA, the lower the chance of irritation (and its effectiveness). PH: a high ph neutralises GA, making it useless. Pixi Glow has 5% glycolic acid at a ph of 4.1. This is fairly high. Roughly 1.8% of glycolic acid survives to exfoliates your skin. The Ordinary has a 7% glycolic acid at a ph of 3.5-3.7. This is much more friendly to GA. Roughly 4.4% survives unscathed. The bottom line? The Ordinary is more effective but also more irritating. P.S. At this dose, we’re talking irritating for sensitive skin. Most people will be able to use it without problems. Did you know that aloe is 99.5% made of water? The goodies that make it so soothing and moisturizing are in the remaining 0.5%! Some of these goodies are called polysaccharides and they’re more abundant in aloe vera juice than aloe vera water. Why this matters? Because Pixi is using a dollop of the juice and The Ordinary a few drops of the water. That makes the Pixi toner a little bit more hydrating. It doesn’t really do much for the skin but I had to mention it because it can be irritating if you have super sensitive skin. They both are rich in humectants that hydrate skin with a sprinkle of antioxidants thrown in for good measure. The Ordinary formula is slightly different because it features several types of water and plenty of amino acids (Pixi has amino acids, too – just not as many). Amino acids are the building blocks of proteins, including collagen and elastin. They also hydrate skin and help it heal faster. Long story short: you need amino acids in your skincare routine. Pixi Glow (£18.00): available at Asos and Cult Beauty. 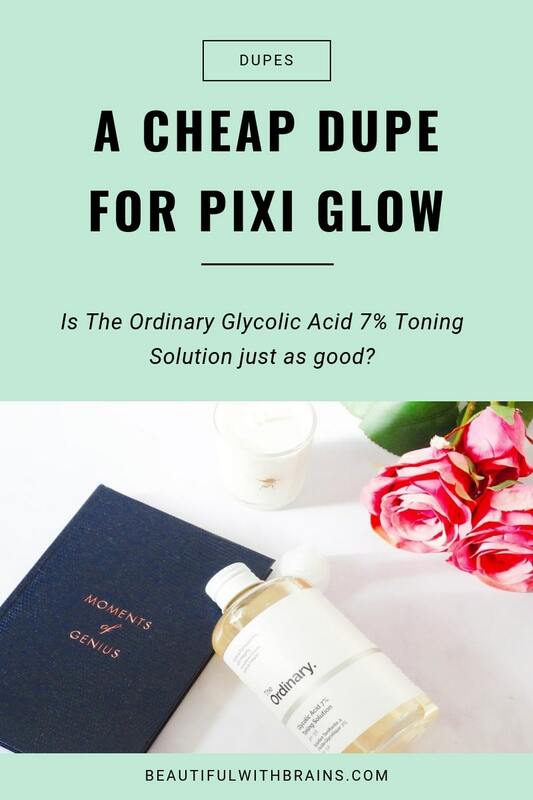 So, Is The Ordinary Glycolic Acid 7% Toning Solution A Dupe For Pixi Glow? Yes, yes, yes! A more effective one, too! Pixi Glow Ingredients: Aqua, Aloe Barbadensis Leaf Juice, Hamamelis Virginiana (Witch Hazel) Leaf Extract, Aesculus Hippocastanum (Horse Chestnut) Seed Extract, Glycolic Acid (5%), Ammonium Glycolate, Glycerin, Glucose, Fructose, Sucrose, Urea, Dextrin, Alanine, Glutamic Acid, Hexyl Nicotinate, Panax Ginseng Root Extract, Phenoxyethanol, Sodium Benzoate, Biotin, Polysorbate 20, Fragrance. The Ordinary Glycolic Acid 7% Toning Solution Ingredients Aqua (Water), Glycolic Acid, Rosa damascena flower water, Centaurea cyanus flower water, Aloe Barbadensis Leaf Water, Propanediol, Glycerin, Triethanolamine, Aminomethyl Propanol, Panax Ginseng Root Extract, Tasmania Lanceolata Fruit/Leaf Extract, Aspartic Acid, Alanine, Glycine, Serine, Valine, Isoleucine, Proline, Threonine, Histidine, Phenylalanine, Glutamic Acid, Arginine, PCA, Sodium PCA, Sodium Lactate, Fructose, Glucose, Sucrose, Urea, Hexyl Nicotinate, Dextrin, Citric Acid, Polysorbate 20, Gellan Gum, Trisodium Ethylenediamine Disuccinate, Sodium Chloride, Hexylene Glycol, Potassium Sorbate, Sodium Benzoate, 1,2-Hexanediol, Caprylyl Glycol. I have an allergy to fragrance (Pixi) and sensitive skin, especially to botanical extracts such as the horse chestnut (Pixi) and the rosewater (The Ordinary). So neither one is an option. I can use Alpha Skincare or Paula’s Choice, as both are fragrance free. Sherryg, what a shame! It would be so much better if all skincare were fragrance-free. I’m so glad you posted this – I am nearing the end of my bottle of Pixi and found The Ordinary one whilst looking for a cheaper alternative. You’ve confirmed that I should buy it! Porcelina, I’m sure you’ll love it just as much, if not more! Can oily or combo skin types still use glycolic acid treatment, maybe just once a week? The collagen-boosting benefit sounds too good to ignore, or do salicylic acid also do this? Great review! I have dry, sensitive skin. Can I use the Ordinary one over a base of aloe vera? Or spray some aloe vera or soothing mist right after the toner? Will this reduce help with possible irritation? Thank you! Can I use the Ordinary Toner before their 10% Lactic Acid in the PM? Michelle, glycolic acid and lactic acid are both exfoliants. It’s best to use only one or you may strip away too many layers of skin. Can you use the Ordinary Toner with Sunday Riley Good Genes? Thanks! Crissy, if your skin can tolerate a double dose of exfoliation, yes. But I personally wouldn’t use them together. Sorry, no. I have used both of them and they certainly are not dupes. Both have very different ingredient lists. GT gave me amazing results whilst Ordinary’s toner did absolutely nothing which is a shame cos I really wanted to like it. YMMV with the results you’ll get from both but to call it a dupe is misleading info. Sarah, yes they have different ingredients but the actives are the same and that’s what determines the performance of a product. I’m sorry you didn’t like The Ordinary. I’m using it right now and it’s working well for me. Can i use The Ordinary Glycolic Acid at the same skincare time with Niacinamide ? Marelyn, there’s a small possibility that using glycolic acid and niacinamide together may make both less effective but it’s unlikely to be a significant difference. In any case, if you’re worried, use niacinamide in the morning and glycolic acid at night. I used the Ordinary glycolic toner once and my skin prickled and stung. Is this due to an allergy or sensitivity like the first commenter or because it is so strong? My skin can tolerate daily use of the Mario Badescu glycolic cleanser. E.S. Glycolic acid is very diluted in a cleanser. The Ordinary toner is more powerful so it may indeed prickle because your skin isn’t used to it. A mild tingling is perfectly normal but if it stung really badly than it’s an allergy. In the first case, I’d suggest you start using it only a couple of times a week to get your skin used to it. Did you have any other symptoms apart from the sting? If there was redness or swelling it’s more likely to be an allergy so avoid. when fading of hyperpigmentation and blemishes which wins? Pixi Glow or The Ordinary? Kyla, I’d say The Ordinary because it has a slightly higher dose of glycolic acid.